Way back in the mists of time, the Walt Disney Company expressed an interest... an interest mind... in making a motion picture based on John Lucarotti's 'Marco Polo' serial for the first season of Doctor Who. Needless to say, it didn't go much further than an enquiry. 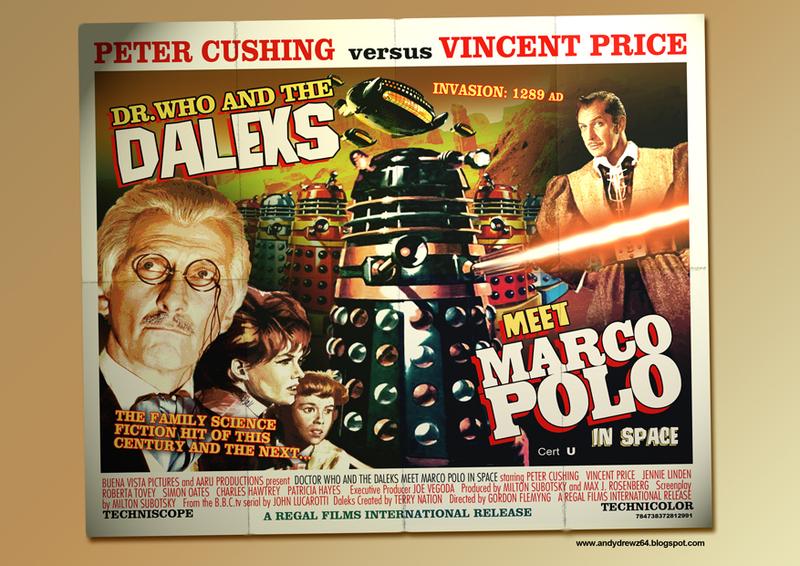 In the end, the movie making was left to Milton Subotsky and Max Rosenberg - who bought the rights to Terry Nation's first two Dalek tales and made 'Doctor Who and the Daleks' and 'Daleks: Invasion Earth 2150AD'. There was some thought given to a third one based on 'The Chase' but the failure of the Daleks to light up the box office a second time meant it didn't get any further than the earlier Walt Disney effort. The upshot of me writing all this is to set up this cinema poster someone on the Twitter ( @outonbluesix ) suggested I do a poster for the Marco Polo one.